Claiming missing airline reward miles was covered in four previous articles on this website now, but here’s a twist to that process that makes me revisit this topic one more time. At the time, I did put in a claim for uncredited miles with Lufthansa, but did not have any similar request for British Airways. Thanks to my parents being on British Airways flights before signing up for BA’s loyalty program, I finally did get to test the entire process with an actual mileage claim. 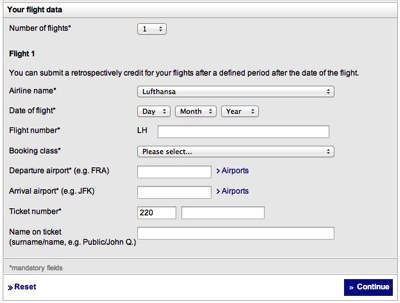 It is safe to assume that, like any other airline, Lufthansa keeps old booking records. With the ticket number serving as a unique identifier, why then are you required to fill in seven fields? 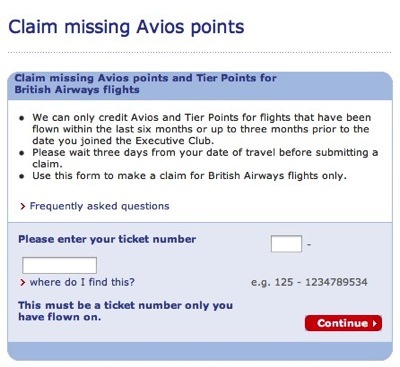 British Airways’ form requests that you enter exactly one data item which is, of course, the ticket number. My parents’ newly created accounts had a mileage balance of exactly zero when I brought up the claim form this time. 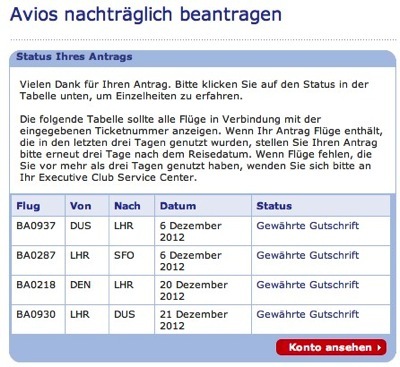 Entering a ticket number brought up a table of flights that was similar to the one I had seen previously. The status, however, was now given as “Gewährte Gutschrift”: “Credit Granted”. Clicking the “Konto ansehen” (“View Account”) button took me back to the account’s main page, and the balance now showed a non-zero amount. Not only was it enough to enter just the ticket number; the respective reward miles were credited immediately without any wait time! The mileage credit I had requested from Miles & More had been for a partner airline, and not for a flight with Lufthansa themselves. This may explain why it took a few weeks to see those miles added to my account. It does not explain, however, why Lufthansa generally insists that you enter multiple redundant data items, whereas British Airways impressively demonstrates that this process works just fine if all you have is the ticket number. Previous Previous post: No-reply emails are bad. This is worse.